Powdery mildew can be seen every year on perennials, lawns or landscape plants at some point in the growing season. As a fungal disease, it is not limited to just ornamental plants. Vegetables like pumpkins, squash, melons and grain crops, and even houseplants, can be added to the list too. The white-colored spore growth on the surface of plant tissue gives powdery mildew its name. Some say it looks like powdered sugar, others say talc powder, but I am not tasting it to find out. Find a lilac leaf and with your moistened thumb, you can rub the leaf clean. You have not gotten rid of the fungal organism, just the visual evidence. While most fungal disease is worse in wetter weather, powdery mildew can be a problem in even dry weather. You might think that since it can be on Lilac, Ninebark, the lawn, or flowers like Monarda and Phlox, that it is all the same. Actually, powdery mildew is very host specific and does not overlap plant species very often. Some plants like Phlox, Lilac and cucumbers are routinely attacked by it. If Phlox foliage is damaged before bloom, the blooms are smaller, do not last as long, and are not attractive. 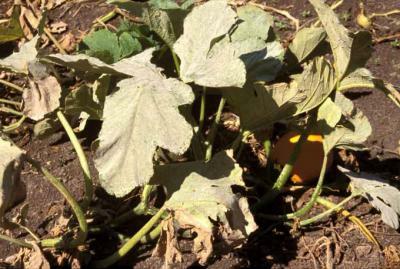 Usually powdery mildew shuts down our cucumbers late in the summer and knocks down the pumpkin foliage so the yellow pumpkins begin to show up. In the home landscape, a few cultural strategies help manage powdery mildew. When possible, make sure foliage dries out before dark, and when there is dew, foliage should dry off as soon as possible each morning. If you are watering late in the day, water the soil and not the plant. Be mindful of your exposures as you plan a garden bed. Remember, while the afternoon sun is more intense, it will be the morning sunlight that dries foliage. A good strategy for Phlox would be to thin the number of stems each spring. This aids in air movement, and puts more energy into the remaining stems giving bigger blooms. In the lawn, powdery mildew is common in the shadier parts of the yard, especially the northern exposures. You can promote more powdery mildew if the lawn receives high rates of nitrogen fertilizer, as the fast growing tender growth is quickly susceptible. Powdery mildew does not seem to stop a lilac from blooming next spring though, and most of us do not worry about it in our lawns too much. In the spring, the lawn will be green again. As with any fungicide, those treatments need to be on the plant before the fungus shows up to be effective, so add one more thing into your garden journal and be ready for next season.